The gas alarm monitor type GJD-04C is used where only two detection points are needed, which requires two gas detectors. 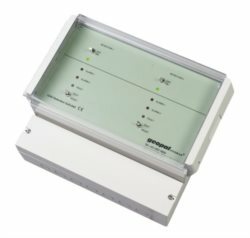 The alarm monitor is designed to receive and process the signal from the connected detectors, carry out the necessary signal processing, and set off the gas warning and gas alarm. The relay circuits has relay contacts for low alarm, high alarm and fault. The relay circuits facilitate the operation of external functions like ventilation systems, magnet valves, cutting off the power supply.